If you’re looking for a starting point for mod-friendly jazz, the Mod Jazz series through Ace Records is pretty much essential listening. 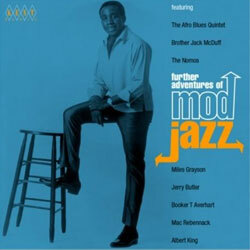 And a new volume is coming on June 30th 2008 – the Further Adventures of Mod Jazz. Packed with lashings of Hammond, smoky sax, a bit of blues, some R&B, but essentially, lots of solid beats for the feet. It includes the likes of Dr John, Leo’s Five, Brother Jack McDuff, Albert King, Ike Turner, Bobby Donaldson and Hank Jacobs, not to mention a new version of the jazz classic ‘Walk Tall’, a big brassy version of ‘All Around The World’ aka ‘Grits Ain’t Groceries’ to name just a few. Check out the full tracklisting over at Ace and if you like what you see, order a copy or try your hand in our competition. Yes, we’re giving some away in the very near future.